Perhaps you need an intercom. Maybe you want to be able to communicate with your house from your shed or garage. Or perhaps as in my case some years ago, you are upstairs in your bedroom doing your schoolwork, you want to know when dinner will be ready, and you are too lazy to get up and shout down the stairs to find out. If so, then this simple intercom project is for you. I have made many of these and never had any trouble getting them working. The simplest possible way to make an intercom is by connecting two loudspeakers in series with a battery, as in the circuit shown here. One of the speakers must be at a remote location. Sound waves impacting on either of the loudspeakers induce a current in its coil which is translated back into sound by the other speaker. Yes, a loudspeaker works just fine as a microphone. It will work, but unfortunately this arrangement has a number of disadvantages, not least of which is that there is no amplification. You have to really shout into one of the loudspeakers just to hear a whisper in the other. Unless the remote loudspeaker is very remote, the listener will hear you shouting rather than the whisper from their loudspeaker. But if they are very remote the wiring resistance will reduce the signal. Additionally the battery will run out very quickly. And you can't use a transformer-rectifier type mains power supply because all you will hear is 50 (or 60 in US) Hz hum. Hugh VA3TO wrote to me about this "simple intercom" circuit, pointing out that it represents essentially a short circuit at DC, which would blow the speaker coils. He writes: "I think you would blow the speaker coils. You typically need a mic amp and a speaker amp and the speaker is usually A/C coupled using a capacitor or isolation transformer.". Well, I do agree with Hugh, but nevertheless I do recall actually connecting two speakers as shown, MANY years ago before I knew better (not that I know much better now), and it did work. As I said, the batteries ran down quickly (indicative of high current flow). The speaker coils didn't blow but whether that was because the batteries weren't chunky enough to do any damange, or the long lengths of wire added some meaningful resistance into the circuit, I couldn't tell you. Anyway it might be wise to be cautious about trying this one at home! Another way to build an intercom is to find an intercom project on the internet, or in a magasine or book, and start building. I tried to do it this way too and was never pleased with the results. When I got anything working at all, the volume was never satisfactory. The circuits are too complex and the whole thing is too difficult. Quite by accident I discovered a better way. A much better way. All you need is an old audio cassette player. It doesn't need to be stereo and it doesn't need to be able to record. It doesn't even need to be high quality. Anything will do. You can often get hold of an old broken cassette player, and nearly always the fault will be in the mechanism, the electronics will be fine. 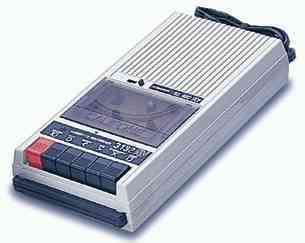 The cassette player will usually include a transformer mains power supply, which you can use to power the intercom. The important feature of the cassette player electronics is the large amount of amplification present. The signals from the magnetic pickup are extremely weak and must be amplified considerably to reach a decent audio volume. Perfect for an intercom. Take it apart and discard the mechanical bits, taking care to keep all the electronics and connections intact. If the cassette player is a record as well as play type, the same magnetic head is used for playing and recording. There will be an additional head on one side which is used for erasing in the record mode. Just cut this one off, remember the important play/record head is the middle one. The other thing you get in a play/record cassette player is a switch on the circuit board which switches the electronics between its "Play" and "Record" modes. In all the examples I've seen, the switch is sprung loaded and defaults to the "Play" mode, so you don't need to worry about it. Replace the play/record head with a long twin cable, routed off to your remote location, and connect a spare loudspeaker to the other end! That's it, a one-way intercom! The sensitivity of this intercom is amazing. I have tried this circuit with several different audio cassette player circuit boards, and it worked with no trouble every time. I placed the remote loudspeaker on a high shelf in the kitchen. From the bedroom loudspeaker end, any conversation in the kitchen could be heard loud and clear, even whispered. The ticking of the clock on the mantelpiece on the other side of the room could also be heard. You won't get this type of sensitivity easily on any of the real intercom projects. In order to get a two-way intercom you need to arrange for some switching. Only one end will be able to speak at any one time: this is more like a walkie-talkie radio link than a telephone where you can both speak at once and still hear each other. In the case of this intercom the sensitivity is so great that audio feedback would make a simultaneous two-way link impossible anyway. The diagram below shows a simple arrangement using a 4-pole 2-way switch. The first intercom I made this way used old telephone exchange switches, they had 8 or 10 poles at least. The switch just reverses which loudspeaker is used as a microphone and which as the loudspeaker (the receiving end). All sorts of variations are possible, using more switches. Or, you could use relays and arrange for the switching to be possible from either end of the communication link. That way your remote station can also choose to speak to you, rather than just you being in control of the link. I even built a version with 4 intercom stations, some having limited control over who they could speak to, and the master station being able to communicate with any of the other 3. There is one final point to note. The amount of amplification is so much that you sometimes find you receive radio signals when the remote loudspeaker is acting as the microphone, because of the long wire acting as an antenna. If this occurs you can cure it easily simply by putting a small capacitor in parallel with the input (as in my example circuit board pictured above). Try 0.001 uF. I seem to have placed a resistor in parallel with it too. With some experimention you will easily be able to eliminate the unwanted radio interference without significantly decreasing the senstivity to your wanted signal. It would also help to use screened cable to connect to the remote speaker. Ray Sills K2ULR comments: I found your website from an email I received on a computer email list. Nevertheless, you have a very interesting site. I especially enjoyed the pages about home-make components. Another interesting item was the intercom circuit. I remember reading decades ago about a simple intercom, very much like that first diagram you had posted. Only, this one did not use a battery at all. It was "sound powered". I made one once, and it worked fairly well. The secret is to use transformers. The original article used output transformers designed for tube (valve) radios with a 4 ohm secondary and a 2000 ohm primary. For the intercom, the speakers were wired to the low Z windings, and the "primary" high Z windings were connected to twisted wire, which connected (at a distance) the two transformers. The transformers would act to boost the voltage sent down the wire, and reduce IR losses, resulting in more power being transmitted to the other end. Of course, it's a symmetrical system, so you can talk and listen at both ends! It's no better than a shipboard "speaking tube" but it did work.